Alfa Romeo's Stelvio isbuilt on the Giorgio platform. 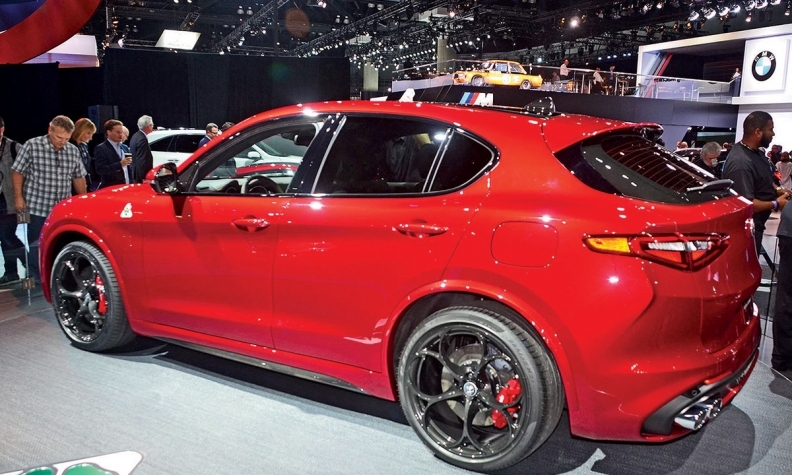 LOS ANGELES -- Alfa Romeo's new rear-wheel-drive platform underpinning the Giulia sedan and Stelvio crossover is likely to be used on other Fiat Chrysler Automobiles vehicles, the brand's head has said. Alfa Romeo said it spent 1 billion euros (Cdn $1.43 billion) developing the platform, which it said would underpin eight models ranging from a compact hatchback to a large sedan. In November, an internal FCA source and one source at an FCA supplier, told Automotive News, the Dodge Challenger coupe and Dodge Charger and Chrysler 300 sedans won't be redesigned onto the automaker's new Giorgio platform until the 2021 model year, when FCA is likely to discontinue production of one of the large sedans. All of them are currently built at the company's Brampton factory. The Giulia has received high praise in the automotive media for its handling abilities since its launch in the U.S. this year. The Stelvio will launch in the second quarter of next year and will be available with a 505-hp V-6 and a 280-hp 2.0-litre inline-four turbo.